Disclaimer: While an effort has been made to assure a reasonable repair procedure, no guarantees are made. We are not responsible for any damage or injuries that may occur as a result of following these instructions. The only vehicle these procedures has been tried on is a 1929 Plymouth Model U. Applicability to any other vehicle is for you to decide. 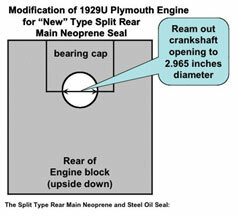 First, the rear opening of the engine block/main seal cap must be reamed out to a diameter of 2.965 inches. This is to allow space for the lip of the neoprene seal to fit between the seal surface of the crank and the engine block opening. This is the only modification required for the 29U Plymouth engine. If this is not done, the seal will not fit properly and it will leak!. It is best to have this done during an engine overhaul. If you only want to replace the rear main seal without pulling the engine, and this modification has not been performed, replacing the rope seal is the preferred method. Have the machine shop polish the surface of the crankshaft where the seal will ride. Pre-cut two strips of cork for the slots on the sides of the rear main cap, for step 4 below. When you open the package with the “new” split main seal, there will be two halves coated with preservative, along with two funny shaped rubber things. Toss the funny rubber things aside - they are not used in the 29U Plymouth engine. Clean all the preservative off the “new” split main seal using a suitable solvent. Note: Do not remove the thin mesh screen material from the neoprene surface - it is part of the seal! The time to install the seal is just before you are about to re-install the crank shaft. Clean and blow dry the rear surface of the block and rear main cap where the seal halves will mate. 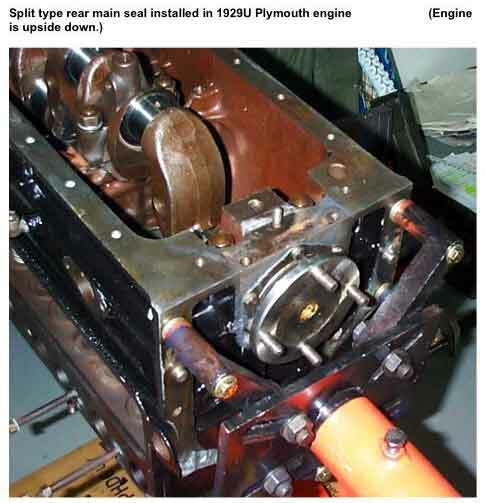 Coat the inside of one seal half with a thin coat of PermatexTM Aviation Sealant (or PermatexTM Super “300” Form-A-Gasket Sealant), and also put a thin coat on the engine block were the seal will mate up. Wait a few minutes for the PermatexTM to get tacky, and attach the seal half to the block with the original bolts used for the old rope type seal, but with new lock washers. Note: The original bolts have a thin head to allow clearance for the flywheel bolts. If you tossed these original bolts and are using new ones, you should grind off about 1/3 of the bolts' heads. Do the same with the other seal half and the rear main cap. Yes- that's right - install the seal half to the rear main cap before the cap is installed in the block! Crank shaft Installation. Coat the lip seals with “assembly lubricant.” Try not to get any on the ends of the seal halves that mate to each other. Note: Assembly lubricant will stay put and provide vital lubrication until it is washed out with oil. As for those two little slots on the side of the rear main cap, originally those were made of compressed felt and usually soaked with a sealer, like Indianhead Shellac. However, you won't find gasket felt these days. Most people use cork for these, although I have even heard of someone using strips of wood! My suggestion - cut two strips of cork so that they will fit loosely in the slots, but go all the way down. Now coat each strip of cork with a generous amount of Hi-Temp RTV Silicone gasket maker - (I use PermatexTM ULTRA BLACK®) Now insert the gooey strips in the slots - push them down all the way and hold them in a few minutes until they “set” - so they will stay, then wipe off the excess that squeezed out the top, being careful to leave a fairly smooth surface. It is OK if it sticks out a tiny bit. As with any newly rebuilt engine, it is important to pressurize the oil system before you first try and crank the engine. Otherwise, the bearings and seals may sustain a significant amount of wear when you first crank the engine. (It is important to use assembly lubricant on all the bearings as the engine is being reassembled!) 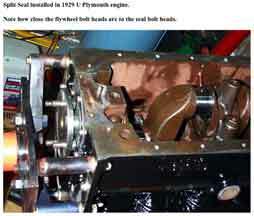 Modern cars allow for a special tool driven with an electric drill to pressurize the oil system - but not the early Plymouths. Recommendation: Remove the cover plate from the oil pump and carefully pack the oil pump with Vaseline® Petroleum Jelly to prime the pump. Note: Never use Grease to prime a pump! You will never get it out of the oil system. Vaseline will get thin when the engine oil gets hot and be washed out of the system. After filling the crankcase with oil, leave the spark plugs out. Using the hand crank, turn the crankshaft about 25 rotations. Now, use the electric starter to turn the crankshaft until you see the pressure gauge rise. You should see a pressure of about 20 psi when the system is fully pressurized. Excessive air in the line to the oil gauge may cause the gauge needle to vibrate rapidly. You may want to bleed the oil line to get the air out of the line to the gauge. Loosen the nut behind the oil gauge a little, hold a pan under it, and when oil starts to come out around the nut, tighten it up. 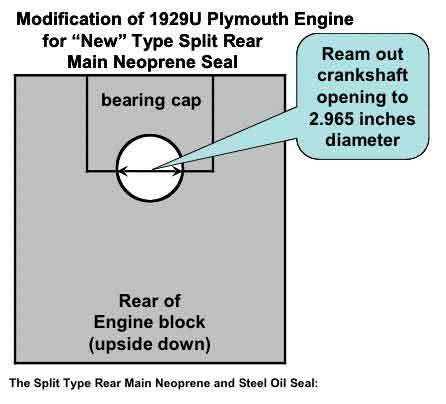 If you carefully follow these directions, your 29U Plymouth's rear main seal should not leak.